In England the decades around 1600, known as the Elizabethan and Jacobean periods, were a truly 'golden era'. The arts flourished, not the least thanks to the court where artists, among them famous musicians, were most welcome to display their skills. In the homes of the aristocracy music also played an important role. Many aristocrats were able to play an instrument, and often that was the virginal. As a result much music for keyboard was written, and a number of collections are still a rich source for modern performers. A particularly important source is the Fitzwilliam Virginal Book. It is named after the 19th-century owner of this collection, who also gave his name to a museum in Cambridge. How exactly this collection has come into existence and who has put it together, is still a kind of mystery. It was once called Queen Elizabeth's Virginal Book, but she certainly hasn't been its original owner as some of the pieces in the collection were written after her death. That doesn't exclude that she might have known a number of pieces from the book, as it is a compilation of pieces of various dates of composition. Some of them were copied from earlier collections of keyboard music. The Fitzwilliam Virginal Book contains 297 compositions, mostly by English composers like Bull, Byrd and Gibbons, and some by foreign composers, such as Sweelinck. A number of pieces are also known from other sources, but in particular most of the keyboard works of Giles Farnaby are known only from this book. Also represented are some little-known composers like Nicholas Strogers, William Inglot and Ferdinando Richardson. The genres which were common at the time are represented: variations on popular tunes, dances, character pieces and works of a liturgical character. When performers select pieces from such a large collection, they often choose the same. The best-known names appear most frequently in such selections, and as a result many pieces are hardly ever performed, or are included in anthologies, which make them hard to find. 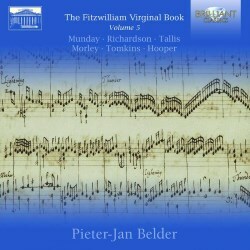 That is a good argument for a project like that of Pieter-Jan Belder and Brilliant Classics: the recording of the entire Fitzwilliam Virginal Book. The 5th volume, which is under review here, includes a large number of pieces which are seldom performed. On the first disc, for instance, we find two pavan and galliard pairs by Ferdinando Richardson, one of the lesser-known composers represented in the collection. He was not a professional composer, and Richardson was not his real name. In fact he was called Sir Ferdinando Heyborne, Groom of the Privy Chamber of Queen Elizabeth. Despite being not a professional composer, his pieces included here are of fine quality, and that is certainly due to the fact that he was a pupil of Thomas Tallis, and probably also William Byrd. It is notable that each pavan and each galliard is followed by a variation. A complete recording of Richardson's keyboard words is available on Naxos (2014), played by Glen Wilson. Richardson's teacher Tallis is also represented here. Today he is best-known for his sacred music, for instance his setting of the Lamentations of Jeremiah, but as he was active as an organist for about fifty years of his life, he must have been highly skillful at the keyboard. However, only a small number of keyboard works have come down to us, and most of them have a liturgical purpose. Only five pieces are of a non-liturgical character; two of them are included in the Fitzwilliam Virginal Book. Even so, they are based on plainchant: the offertory Felix namque es, sacra virgo Maria was prescribed in medieval liturgies for certain feasts and for votive Masses of the Virgin. In both pieces Tallis includes the cantus firmus in long notes; the other parts add the often brilliant polyphony. These pieces are clearly different in idiom from most of the repertoire in the Fitzwilliam Virginal Book. The first disc opens with five pieces by John Mundy (or Munday), son of William Mundy. The latter almost exclusively composed sacred vocal music; part of that and some instrumental music could have been written either by him or by his son. The Fitzwilliam Virginal Book includes five pieces by John, and these seem to be his only contributions to the genre of music for keyboard. Notable is the Fantasia III, which is one of the first character pieces in history, as it describes the weather in an English summer. Mundy has given precise indications of the meaning of the various episodes. Munday's Joy is a piece of the kind written by various composers, who connected their name to a piece, probably as a kind of self-portrait. Goe from my window appears in two versions: here we hear a version with four variations, which is probably by Thomas Morley; the same piece was included in Volume 1 with a fifth variation, which seems to be from Mundy's pen. It is a bit odd that the former version is ranked among the compositions by Mundy in the track-list; I have 'corrected' that in the track-list below. The second disc is divided into three sections. The first two are devoted to two of the best-known composers of the English renaissance: Thomas Morley, a composer of the Elizabethan era, and Thomas Tomkins, who belongs to the Jacobean period. Morley has become most famous for his madrigals as well as for his book A Plaine and Easie Introduction to Practicall Musicke. He was a pupil of William Byrd and was active as an organist, but only a few number of keyboard works from his pen are known, most of which are included in the Fitzwilliam Virginal Book. In the Pavan and Galliard (CLIII and CLIV) Morley quotes John Dowland's Lachrymae Pavan. There seems to be some misunderstanding about the last piece in this section: La Volta, with the addition "set by Byrd". Its full title is La Volta L. Morley; Davitt Moroney, in the liner-notes to his complete recording of Byrd's keyboard oeuvre (Hyperion, 2010), states that "the work has no connection to Byrd's pupil, the composer Thomas Morley". It could have been intended for either Edward Parker, the twelfth Lord Morley, or for his first wife, Lady Monteagle. I have corrected the name of the composer in the track-list below. Next follow three pieces by Thomas Tomkins, one of the main and most respected composers of his generation. He was a versatile composer, whose oeuvre includes a large number of liturgical works, but also madrigals, consort music and works for keyboard. For many years he worked as an organist in Worcester Cathedral. In 1646 the city surrendered to the Parliamentary forces, and as a result cathedral services were almost completely discontinued and Tomkins lost his job. The Worster Braules refers to the town, where he worked for so many years; braul is another spelling of brawle, the English word for a group dance, generally known as branle. The Hunting Galliard is close in character to John Bull's The King's Hunt. A number of pieces in the Fitzwilliam Virginal Book don't mention the name of the composer. They are mostly rather short and uncomplicated, and Belder suggests that they may be from the pen of the compiler of the collection. Among this category we find pieces based on popular tunes, such as Watkins Ale, and an arrangement of Dowland's song Can she excuse my wrongs. Two pieces are by Edmund Hooper (not Edward, as Belder calls him in his liner-notes), who from 1604 was Gentleman of the Chapel Royal. Seven keyboard pieces from his pen have been preserved, two of which are included in the Fitzwilliam Virginal Book. This set of discs is another captivating portrait of the art of the English virginalists. Listening to these two discs, one can only be impressed by the quality and the variety of the music which was produced at the time, even by those composers, who today are largely unknown quantities. I was particularly pleased by the pieces by Ferdinando Richardson, and it has encouraged me to look for Glen Wilson's complete recording of his keyboard oeuvre. The pavans and galliards have a certain solemnity, and are characterised by broad and brilliant gestures, and that comes off perfectly in Belder's performance. In pieces like Mundy's Munday's Joy and Tomkins's The Hunting Galliard he displays a keen sense of rhythm. Very nice is also the rhythmic drive in a piece like Mundy's Fantasia II. Tallis's two versions of Felix namque also belong among the highlights of this set. Belder uses three harpsichords: two different copies of a Ruckers, and an Italian harpsichord after Giusti. All three are perfectly suited to this repertoire. The only regret is that Belder completely omits the virginals. There are probably two or three volumes to go, until the complete Fitzwilliam Virginal Book is available on disc. This is definitely one of the most important recording projects of this decade.